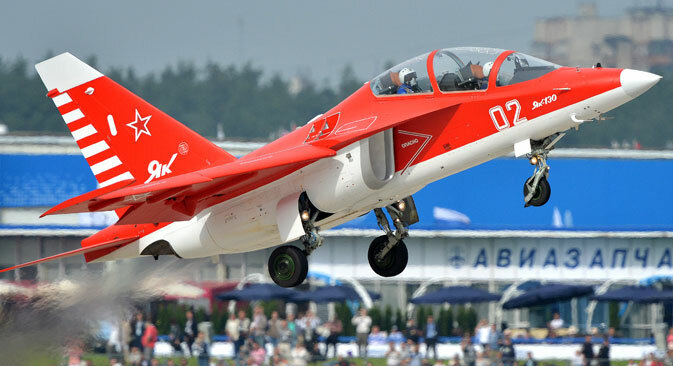 The Yakovlev Yak-130 is Russia’s newest trainer aircraft, capable of being programmed to recreate a range of different flight conditions for trainee pilots as well as functioning as a ground-attack craft. Russia now hopes to take advantage of the plane’s export potential. In the Russian army, the Yak-130 is called "the flying iPhone”: It is reliable, easy to manage and, most importantly, highly oriented to a specific customer and their needs. "I have never seen an aircraft easier to manage and more flexible than this one," said former commander of the Russian Air Force and Hero of Russia Vladimir Mikhailov of the new trainer aircraft after a flight on the Yak-130. The general was certainly cunning – a training flight is never "easy", and an aircraft is never "flexible." The thing is that, just as with the iPhone, the Yak-130 features technical solutions that make it as user-friendly as possible. However, the Yak-130 can resolve not only training problems. This “flying school desk" can be easily converted into a light fighter or ground-attack aircraft if necessary. The craft has 9 hardpoints – 6 under its wings, 2 on the wingtips and 1 under the fuselage – on which it can carry a weapon load up to 6,600 lbs, including air-to-air and air-to-surface missiles, as well as bombs of 550 lb and 1,100 lb calibers, cluster bombs and other aircraft weaponry.